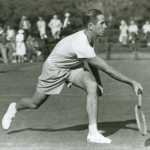 February 25 is special day…100 years ago one of the greatest tennis entertainers and players, Robert Larimore Riggs was born in Lincoln Heights, Los Angeles. He loved the game, he loved the challenge and what he loved more than these two is the show and the excitement. He is still the last American player who . . .